Super Smash Bros. 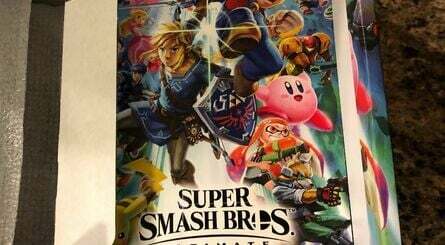 Ultimate doesn't launch until December 7th, but a hardware bundle has just sold on eBay for a cool $1,095, which means that somebody out there is more than ready for the release. 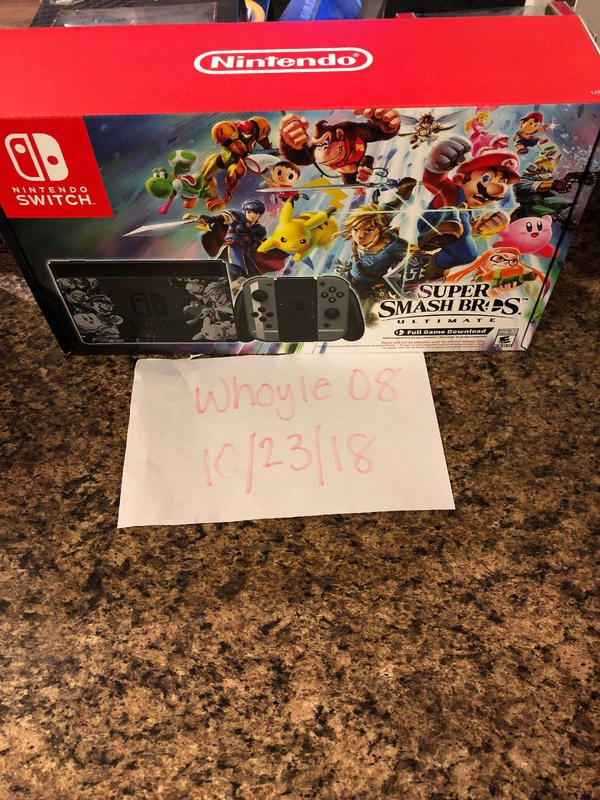 Seller Whoyle08's auction - along with loads of images which attest to its apparent legitimacy - ended today, with the winning bid coming in at well over the standard asking price for the console. 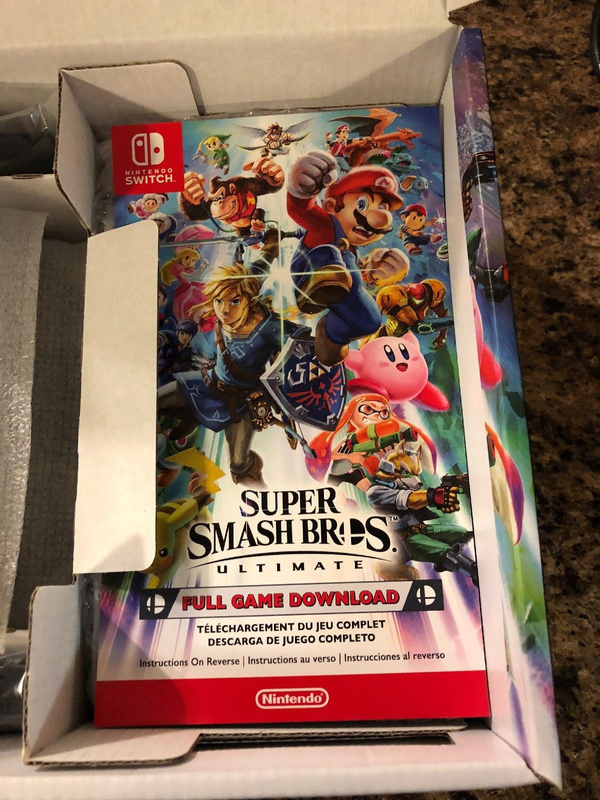 The catch here is that there's a download code included in the box and not the physical game, so the winner won't even be able to play Smash until review codes are issued to the press and media, which would be some time away yet. At least they have the rather natty Smash Bros. hardware - which includes a special Joy-Con and dock design - to keep them company until then. How did the seller get this bundle so early? Well, units will obviously be in production now ahead of launch, and there's a chance this is either a sample or even a unit intended for distribution among the games media. Or, it could be an elaborate hoax - given how talented and skilled some of these pranksters are, it's important to not rule out that possibility. Let us know your thoughts on this super-early bundle purchase by leaving a comment below. Would you have exchanged over $1,000 just for a fancy console design that in a few month's time is effectively going to be worth considerably less? I see the seller doesn't accept returns, that's a warning sign if I ever saw one. but..but why. Why would you do that? I want smash bros as much as the next person, but $1000+ to get the console early but no game is madness. Location is Louisina, I think this is a load of bull. 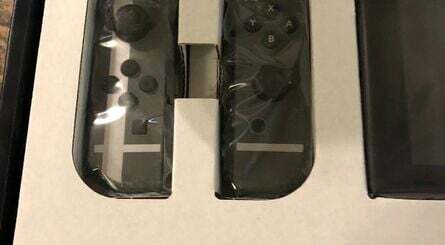 Someone has printed out stickers and just got a normal Switch. But I don't blame the person selling it, I blame the person buying it. They are the problem. Not the first time this has happened. Some people just have more money than brain cells. The thing is if they're really going to pay. There's no reason to fear it won't be available for a normal preorder in a few weeks. That's just stupid. Doesn't look at all like a fake : the lightning is too perfect. Even the best fakes have always problems with the lightning, sometimes just in small details. @Latinomex01 I don't think people doing dumb things is strictly exclusive to America. Want to cool it with the insults? This is a single person, not an entire nation. Lol I'm not dumb enough to do something like that. Even if I had the money. @Latinomex01 I seriously don't understand what is your problem. People in poor countries live without Nintendo consoles, does that mean it's disrespectful if we buy a Nintendo console? No, of course not. This guy spent some of his money and while I wouldn't personally do that, I don't know why he couldn't, it's his decision. And by the way, I'm not American, I just disagree with the comment. It is that lack of humility that doesn't let us accept our own problems and work to correct them. Please don't be this ignorant. The release date isn’t that far away so it’s feasible for this to be out in the wild already. I’m surprised it never reached a higher price to be honest. Nintendo have a cheek including a download code and not a physical version considering the size of the game. I say that as someone who normally prefers digital. By the time you download it you'll be left with 9gb or 10gb tops, on your brand new console with 1 game. I'll be buying this physically even though it's the kind of game I'd prefer to have on my system. Swapping game cards is a lot easier than swapping SD cards though. Are you sure they'll be able to play this when review codes are issued to press? This looks like the retail box. 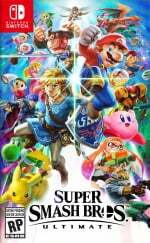 I am sure on Nintendo's website it says that the download code won't be playable until launch date. Just because it sold, it doesn't mean the buyer has paid. I've sold loads of eBay items. When I get a much higher than expected winning bid, quite often the buyer will not pay. Yeah, good luck in getting the buyer to pay for it..
Notice that on the eBay listing, there are conveniently no photos of the dock with its unique design. Only of the Joy-Cons. 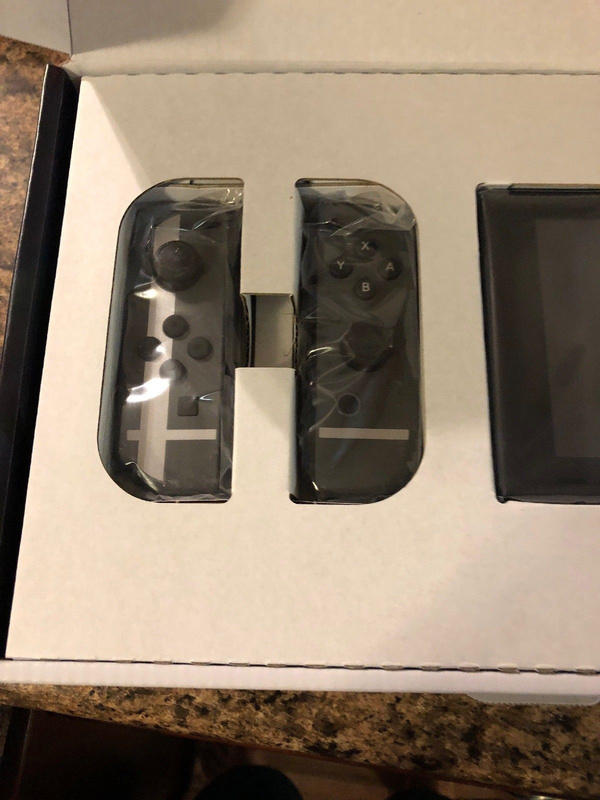 You could very, very easily modify the Joy-Cons to have that appearance. As for the box itself, I guess it could be manufactured based on any available print materials discovered online. 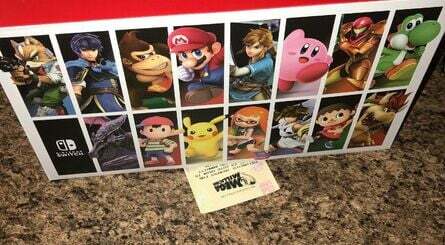 Like the back of the box is just tiles of some of the featured characters? That's suspect, I would expect system information or more info about the game. Dumb news once again, unless the “buyer” has paid nothing is really sold. Couldn’t wait until next week, huh? like when you see Mario Kart for only $5.00, most likely it will say "Case Only" somewhere, but sometimes you see it between $15-$20 with a description similar to "like new, case matches Mario Kart cartridges", people see the higher prices and assume "no one would sell a case only for so high"
Crazy people these days. I would rather wait another year then spend 1000dollars for this. @Latinomex01 If you are going to make dumb comments like this please remove the Mex from your name. You make us all look bad. Wow., I started reading comments and that was a mistake I thought this was a gaming site not MSNBC or CNN . What's this? So he has a console bundle (which is not a bundle at all) with a download code to a game that is not even available on the store? And someone actually bought it for 1 grand? 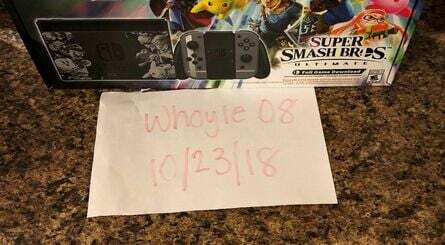 That's an ULTIMATE rip-off, because the only thing he'll get early is a Joy-Con with white tape lines over it, lol. People are insane. We only have just over a month to go. Some people have no patience these days. i thought ebay updated their user agreement policy (along time ago) so that users can't sell certain types of pre-release items such as video games on their web site. because of this i hope that the purchase gets canceled and the buyer gets their money back. and why would someone pay over 500% of the original retail price for an item that hasn't even been released yet? Its better then the mario party one a few weeks back. OK, CUT THAT SHNIZZIT OUT RIGHT NOW !!! you wanna talk politics and sociology, do it in the general chat or Facebook, don't be trying to bring everyone else down with you, now keep that crap out of here !!! If they pay that is. This very well could be a legit hardware bundle since they're close to release. I question if the winner will even pay that amount. If so, then they clearly have a lot of money and less patience/sense. Poor form, auctioning off a review bundle and game code. And yet, those joycon are so offensively phoned in that Nintendo had it coming. What's with the lottery ticket inserted into the photos? @stevenw45 I am pretty sure those ebay ToS only apply if you are doing preorders if you don't have the items on you. While this item hasn't been release the person does have it on hand so it really isn't breaking the rules but I still don't like it. just a bunch of thumbnails of some fighters ??? 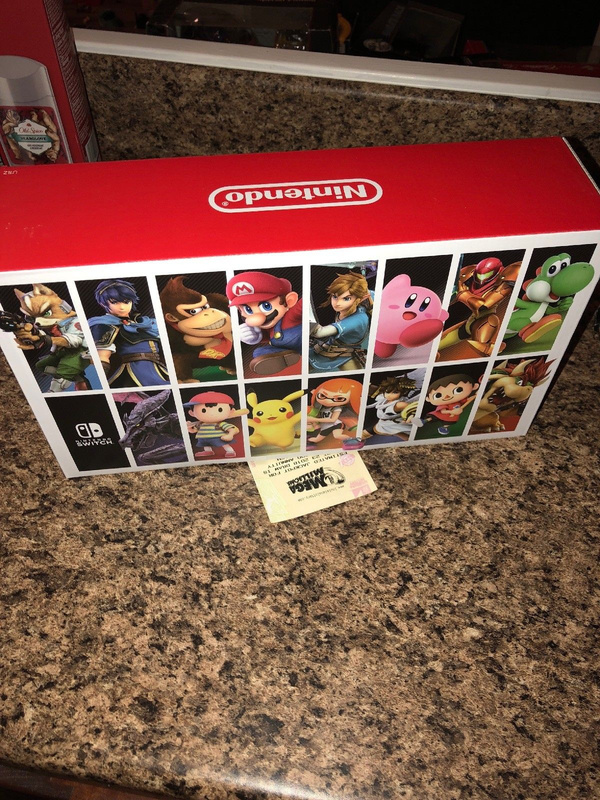 and on the left side of the box (if facing you) is a solid black Smash Bros. logo, but look at the bundles for other games, including the upcoming Pokemon Let's Go bundle, it has print and a more recent addition, a red bar at the bottom, it's the Nintendo Direct notice, you think Nintendo's going to leave that out ??? Busted, this is a display box !!! correct. however, the guy only has the physical hardware on him and not the game. the buyer says that the bundle comes with a digital download code for the game itself. however, since the download codes are not active yet, they are not valid and cannot be (and should not be) sold at this time. pre-orders for purchasing the game from the eShop are not even active yet. also, i read Nintendo's user agreement policy and the buyer seems to be in violation of it, but i am not sure if Nintendo is fully aware of that since no one, not even they read the user agreement policy all the way through. @Damo, was be interesting if Alex had bought it and opened in one of this videos and get angry because inside was just a download code. Was be really fun. @AlexOlney, do it happen, Alex. I want hear many damns when you open the box. Damn.... Damn.. Damn! will be very fun. eBay allows what they call "pre-sale"(/pre-order) items to be sold. For users with basic verifications, a pre-sale item can only be listed 30 days prior to you having the item in your possession; considered the earliest date you can ship the item, and when you are to ship the item on that 30th day. For users with more than basic verifications, a pre-sale item can be listed outside of the 30 window/limit. "Early bird catches the download code"
Early bird catches the worm indeed. Between the megaleak and this, well... let's just say that - now that some copy of the game is surely out there in the wild - as soon as the unusable pre-release download data ends up on a single Switch, that'll be it. It's gonna be datamined to death. So much for the "valid reasons" for an eShop demo not being a possibility. Bah. You're thinking of the phrasal verb "make", here. You make something happen. Although given this is kind of the situation where a "do" verb would be used in English grammar, I understand the confusion. So buying something early breaks some agreement? What gives? 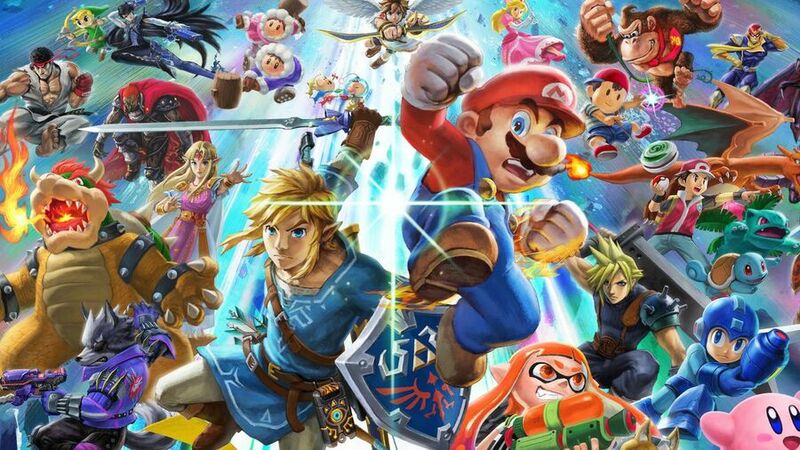 @steventonysmith Nintendo have already said it will take up at least 16gb of space. It says that on the Japanese Nintendo site. The Wii U version came in at 15.7gb. @Capt_N: but what does ebay consider "basic verifications" in this case? @AlexSora89: yes it does. unfortunately. at least for some companies. @stevenw45: I am not completely knowledgeable on that. I believe basic would be verified address, and a source to receive money from, and send money to(bank/credit card, usually). I may be wrong, but in the cases of sellers allowed to operate outside certain restrictions, for pre-sales they need to maintain their credibility in order to continue being allowed to operate outside of those certain restrictions. I believe, but could be wrong, that any seller can get this kind of special-permission status for pre-sale items, if they really want it. However, pre-sale item listings rely on the seller being able to guarantee they will have, and ship the item on a certain date. Just because an item, or game has been pre-ordered at your local (insert store), does not guarantee you will have it on its release date, or by the intended shipping date. This is why many eBayers don't do pre-sale listings. Please don't get me wrong. It's a legal eBay practice. It's just too time-sensitive in nature, and the store you pre-order from may not have a copy for you, on release date; you may have to wait a day, or two. If this is real then I will be happy for whoever purchased this. Care to elaborate a bit on that? I didn't understand. well for starters, there are internal company policies... then there are agreements between companies. an example would be between Nintendo and best buy as well as other companies that sell Nintendo games. that agreement would be broken if best buy or some other companies shipped out pre-ordered games so that the consumer would receive them before the games actual release day. this issue happened with super Mario odyssey and Nintendo got mad at local retailers for it. i think there was an article (posted on Nintendolife) about people receiving their copies of super Mario odyssey a few days earlier than they should have. and i know that this may not be the best example. but it is the only one involving Nintendo that i can think of right now. if eBay itself was the one who was auctioning off the game than someone probably have gotten in trouble already. Yeah, I am fine waiting an extra week or two and saving a grand. My question is why would someone do this?! You can't even play the game yet! I love Nintendo products, yet this isn't worth $1000. In fact, the bundle isn't worth jack to me when it comes to digital games. I want physical all day. If this is true then it's a case of more money than brains. But it wouldn't be the first time we've seen some sucker blow a wad of cash for something everyone else got a few weeks later at a fraction of the cost.